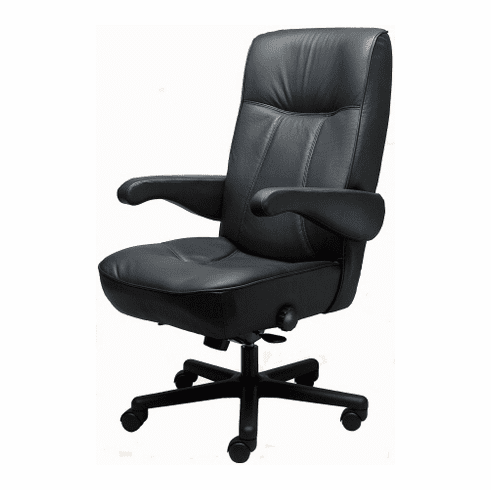 You’re the Commander in this heavy-duty ERA Products executive chair of the same name. You just can’t top an all-steel frame, spring suspension in the seat, and a lifetime warranty. This luxurious chair also features four-way adjustable lumbar support, contoured premium foam cushions, a rocker reclining seat back, pneumatic height adjustment, tilt tension adjustment, and more. It’s also government-rated for intensive, 24-hour use, and built to accommodate practically everyone with its incredible 500-pound capacity. It’s available in commercial-grade vinyl, leather with mock leather trim, all-leather, or stain-resistant fabric. For comfort, durability, and peace of mind, there’s simply nothing better than the Commander.